We print below an account of the battle of Svyazhsk and Kazan, a turning point in the first year of the Civil War that erupted in 1918 against the victorious October Revolution. This eyewitness account was written around 1922 by the Bolshevik political journalist Larissa Reissner, who, as a Red Army soldier, participated in the battle. “Svyazhsk,” translated into English by John G. Wright and Amy Jensen, was published in the June 1943 issue of Fourth International, the theoretical organ of the then-Trotskyist Socialist Workers Party. Reissner’s vivid essay brings these events to life. Larissa Reissner was born in 1895 in Lublin, Poland, then under Russian tsarist rule, into a family of Polish-Russian-German origin. She spent her early years in the Siberian capital city of Tomsk, where her father Mikhail had procured a law professorship. In 1903 her family fled tsarist repression to Berlin, where Larissa spent four years. Exiled Russian revolutionaries and leading members of the German Social Democracy, such as Karl Liebknecht, were familiar guests in the household. Larissa’s father joined the Bolsheviks for a few years. On returning to Russia, Larissa led a privileged, actively intellectual life in St. Petersburg, traveling in socialist circles and writing articles and literary pieces. Joining the Bolshevik Party a few months after the Bolshevik conquest of power, Reissner went on to become the first woman political commissar in the Red Army. For five years she was married to Fyodor Raskolnikov, a leading Bolshevik in the Kronstadt naval garrison rebellion in July 1917. During the siege of Kazan, Raskolnikov was appointed Commander of the Volga Naval Flotilla. Reissner headed the Volga Fleet intelligence section and specialized in espionage work behind enemy lines. Everywhere Reissner went, she wrote passionately of her experiences in the revolution. As Karl Radek, her companion in her last years, wrote in a memoir after her death from typhus in 1926, “She was not a contemplative artist but a fighting artist who sees a struggle from the inside and knows how to convey its dynamics—the dynamics of humanity’s destiny” (Richard Chappell, ed., Hamburg at the Barricades and Other Writings on Weimar Germany [London: Pluto Press, 1977]). 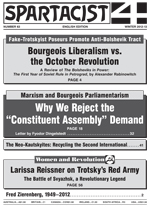 Numerous collections of Reissner’s essays and articles appeared in Russian in the early and mid 1920s. Some were also published in German, but very little exists in English or other languages. Her books include The Front, a collection of her Civil War sketches from which “Svyazhsk” was taken; Afghanistan, based on her experiences as part of the Soviet diplomatic delegation at the court of the Emir; and Coal, Iron and Living People, articles on her travels through the industrial areas of the young Russian workers state. Hamburg at the Barricades, vignettes from the days of the aborted 1923 revolution in Germany where Reissner was a Comintern representative, is available in English and German. The young workers state mobilized the masses of workers and peasants in a political and military war to defeat the imperialist invasion and defend the proletarian revolution. Inspired in part by the Bolshevik promise of women’s emancipation, tens of thousands of women joined the military, becoming soldiers, nurses, commanders and political leaders. Their talents as spies were so valuable that Lenin ordered the establishment of a special school where numerous young women were trained to carry out espionage, scouting and sabotage behind White lines. Many, such as Varsenika Kasparova, head of the Agitational Department of the Bureau of Military Commissars in the Civil War, were later adherents of Trotsky’s Left Opposition. Integral to the Bolshevik vision was the understanding that the liberation of women could not be separated from the struggle for the emancipation of the proletariat as a whole. However, given the desperate conditions of the Civil War and the massive poverty and social backwardness of the predominantly peasant country, the Bolsheviks’ determination to draw women into full participation in economic, social and political life was an overwhelming challenge (see “The Russian Revolution and the Emancipation of Women,” Spartacist [English edition], No. 59, Spring 2006). Lenin and the Bolshevik Party knew that the complete liberation of women depended on the international extension of socialist revolution, to which the Communist International, founded in 1919, was dedicated. The continuing postponement of international revolution enabled a bureaucratic layer headed by Stalin to usurp power in a political counterrevolution in 1923-24. Many of the heroes described in Reissner’s piece fell to Stalin’s purges in the late 1930s. Among them was Ivan Nikitich Smirnov who, like many of Stalin’s victims, had been part of the Left Opposition. A whole generation of revolutionary communists was destroyed; many were executed. Reissner’s writings were disappeared. Even when her works saw a revival under Khrushchev in 1958, the volume dropped “Svyazhsk” with its depiction of Trotsky as the leader of the Red Army. Just as the Stalinist bureaucracy wiped out Lenin’s party, it also reversed many of the gains of Soviet women. But the ensuing Stalinist Thermidor could not wholly erase the gains achieved by women as a result of the socialization of the means of production. The 1991-92 counterrevolution under Boris Yeltsin thrust the working people into misery, exploitation and oppression under capitalism. The International Communist League embraces the liberating goals of communism that inspired such heroism and sacrifice in the Civil War and strives for new October Revolutions worldwide. “Remember Svyazhsk?” And they will clasp each other’s hand again. What is Svyazhsk? Today it is a legend, one of the revolutionary legends which still remain unchronicled but which are being retold over and over again from one end to another of this Russian vastness. Not one of the demobilized Red Army men from among the old-timers, the founders of the Workers’ and Peasants’ Army, upon returning home and reminiscing about the three years of Civil War will skip over the fabulous epic of Svyazhsk, the cross-roads whence the tide of the revolutionary offensive started rolling on all four sides. On the east—toward the Urals. On the south—toward the Caspian shores, the Caucasus and the borders of Persia. On the north toward Archangel and Poland. Not all together, of course; nor simultaneously. But it was only after Svyazhsk and Kazan that the Red Army became crystallized into those fighting and political forms which, after undergoing change and being perfected, have become classic for the RSFSR [Russian Socialist Federated Soviet Republic]. On August 6 (1918) numerous hastily organized regiments fled from Kazan; and the best among them, the class-conscious section, clung to Svyazhsk, halted there and decided to make a stand and fight. By the time the mobs of deserters fleeing from Kazan had almost reached Nizhny Novgorod, the dam erected at Svyazhsk had already halted the Czechoslovaks; and their general who tried to take the railroad bridge across the Volga by storm was killed during the night attack. Thus in the very first clash between the Whites who had just taken Kazan and consequently were stronger in morale and equipment, and the core of the Red Army seeking to defend the bridge-head across the Volga, the head of the Czechoslovak offensive was lopped off. They lost their most popular and gifted leader in General Blagotich. Neither the Whites, flushed by their recent victory, nor the Reds rallying round Svyazhsk had any inkling of the historical importance that their initial trial skirmishes would have. How correct this is from a strategic point of view, I know not. Perhaps the Army if rolled back even further might have gathered into a similar fist on one of the innumerable black dots which speckle the map and thenceforth carried its banners to victory. But indubitably it was correct from the standpoint of morale. And insofar as a retreat from the Volga meant a complete collapse at that time, to that extent the possibility of holding out, with ones back against the bridge, imbued us with a real hope. It was, I believe, either on the third or fourth day after the fall of Kazan that Trotsky arrived at Svyazhsk. His train came to a determined stop at the little station; his locomotive panted a little, was uncoupled, and departed to drink water, but did not return. The cars remained standing in a row as immobile as the dirty straw-thatched peasant huts and the barracks occupied by the Fifth Army’s staff. This immobility silently underscored that there was no place to go from here, and that it was impermissible to leave. I see it now before me, this Svyazhsk where not a single soldier fought “under compulsion.” Everything that was alive there and fighting in self-defense—all of it was bound together by the strongest ties of voluntary discipline, voluntary participation in a struggle which seemed so hopeless at the outset. Human beings sleeping on the floors of the station house, in dirty huts filled with straw and broken glass—they hardly hoped for success and consequently feared nothing. The speculation on when and how all this “would end” interested none. “Tomorrow”—simply did not exist; there was only a brief, hot, smoky piece of time: Today. And one lived on that, as one lives in harvest time. Morning, noon, evening, night—each single hour was prolonged to the utmost count; every single hour had to be lived through and used up to the last second. It was necessary to reap each hour carefully, finely like ripe wheat in the field is cut to the very root. Each hour seemed so rich, so utterly unlike all of previous life. No sooner did it vanish than in recollection it seemed a miracle. And it was a miracle. Medical supplies were almost completely absent at Svyazhsk. God knows what the doctors used for bandages. This poverty shamed no one; nor did anyone stand in fear of it. The soldiers on their way with soup kettles to the field kitchen passed by stretchers with the wounded and the dying. Death held no terrors. It was expected daily, always. To lie prone in a wet army coat, with a red splotch on a shirt, with an expressionless face, a muteness that was no longer human—this was something taken for granted. Brotherhood! Few words have been so abused and rendered pitiful. But brotherhood does come sometimes, in moments of direst need and peril, so selfless, so sacred, so unrepeatable in a single lifetime. And they have not lived and know nothing of life who have never lain at night on a floor in tattered and lice-ridden clothes, thinking all the while how wonderful is the world, infinitely wonderful! That here the old has been overthrown and that life is fighting with bare hands for her irrefutable truth, for the white swans of her resurrection, for something far bigger and better than this patch of star-lit sky showing through the velvet blackness of a window with shattered panes—for the future of all mankind. The rainy August days thus passed one by one. The thin, poorly equipped lines did not fall back; the bridge remained in our hands and from the rear, from somewhere far away, reinforcements began to arrive. Real telephone and telegraph wires began to attach themselves to autumn spider-webs flying in the winds and some kind of enormous, cumbersome, lame apparatus began to operate on the God-forsaken railway station—Svyazhsk, this tiny, hardly discernible black dot on the map of Russia, at which in a moment of flight and despair, the revolution had clutched. Here all of Trotsky’s organizational genius was revealed. He managed to restore the supply lines, got new artillery and a few regiments through to Svyazhsk on railways that were being openly sabotaged; everything needed for the coming offensive was obtained. In addition, it ought to be borne in mind that this work had to be done in the year 1918, when demobilization was still raging, when the appearance on the Moscow streets of a single well dressed detachment of the Red Army would create a real sensation. After all, it meant to swim against the stream, against the exhaustion of four years of war, against the spring floods of the revolution which swept through the whole country the debris of Czarist discipline and wild hatred of anything resembling the bark of old officers’ commands, the barracks, or old army life. Despite all this, supplies appeared before our very eyes. Newspapers arrived, boots and overcoats came. And wherever they actually hand out boots, and for keeps, there you will find a really solid army staff; there things are stable; there the army stands firmly entrenched and has no thought of fleeing. That’s no joking matter, boots! The Order of the Red Flag was not yet in existence in the era of Svyazhsk, else it would have been issued to hundreds. Everybody, including the cowardly and the nervous and the simply mediocre workers and Red Army men—everybody, without a single exception, performed unbelievable, heroic deeds; they outdid themselves, like spring streams overflowing their banks they joyfully flooded their own normal levels. Such was the atmosphere. I remember receiving at that time by extraordinary chance a few letters from Moscow. In them was some talk about the exultation of the petty bourgeoisie preparing to repeat the memorable days of the Paris Commune. And in the meantime the foremost and most dangerous front of the Republic hung by a thin railway thread and flamed, setting up an unprecedented heroic conflagration which sufficed for three more years of hungry, typhus-ridden, homeless war. In Svyazhsk Trotsky, who was able to give the newborn Army a backbone of steel, who himself sank roots into the soil refusing to yield an inch of ground no matter what happened, who was able to show this handful of defenders a calmness icier than theirs—in Svyazhsk, Trotsky was not alone. Gathered there were old party workers, future members of the Revolutionary Military Council of the Republic, and of the Military Councils of the several Armies to whom the future historian of the Civil War will refer as the Marshals of the Great Revolution. Rosengoltz and Gussev, Ivan Nikitich Smirnov, Kobozev, Mezhlauk, the other Smirnov, and many other comrades whose names I no longer recall. From among the sailors, I remember Raskolnikov and the late Markin. Rosengoltz in his railway car almost from the very first day sprouted the office of the Revolutionary Military Council; extruded maps and rattled typewriters—obtained God knows where—in short, he began building up a strong, geometrically perfect organizational apparatus, with precise connections, indefatigable working capacity and simple in scheme. In the days to come, whatever the Army or the front, wherever the work began to sputter, Rosengoltz was immediately brought in like a queen-bee in a sack, placed into the disturbed bee hive and would immediately proceed to build, organize, forming cells, buzzing over the telegraph wires. Despite the military overcoat and enormous pistol in his belt, nothing martial could be discerned in his figure, nor in his pale, slightly soft face. His tremendous force did not lie in this field at all, but rather in his natural ability to renew, establish connections, raise the tempo of a halting, infected bloodstream to an explosive speed. At the side of Trotsky he was like a dynamo, regular, well-oiled, noiseless, with powerful levers moving day after day, spinning the untearable web of organization. I do not recall just what kind of work I.N. Smirnov officially performed in the staff of the Fifth Army. Whether he was a member of the Revolutionary Military Council or at the same time also head of the Political Department; but apart from all titles and frameworks he embodied the ethics of the revolution. He was the highest moral criterion; the communist conscience of Svyazhsk. Even among the non-party soldier masses and those communists who had not known him previously, his amazing purity and integrity were immediately recognized. It is hardly likely that he himself was aware how much he was feared; how everyone feared nothing so much as to reveal cowardice and weakness before the eyes of this man, who never yelled at anyone, who simply remained himself, calm, courageous. No one commanded as much respect as Ivan Nikitich. Everyone felt that in the worst moment he would be the strongest and most fearless. With Trotsky—it was to die in battle after the last bullet had been fired; to die enthusiastically, oblivious of wounds. With Trotsky—it was the sacred pathos of struggle; words and gestures recalling the best pages of the Great French Revolution. But with Comrade Smirnov (so it seemed to us at the time and so we spoke in whispers to each other as we huddled close together on the floor during those already cold autumnal nights)—Comrade Smirnov: this was pure calm when “up against the wall”; or when being grilled by the Whites; or in a filthy prison hole. Yes, that is how one talked about him at Svyazhsk. Boris Danilovich Mikhailov came a little later, directly from Moscow, I believe, or generally from the center. He arrived in a civilian coat, with that bright, rapidly changing expression on his face that people have on being freed from prison or big cities. Within a few hours he was completely overcome by the wild intoxication of Svyazhsk. Changing clothes, he went out on reconnaissance patrol in the vicinity of White Kazan, and returned three days later, tired, his face wind-tanned, his body crawling with the ubiquitous lice. By way of compensation, he was all in one piece. It is a fascinating spectacle to observe the profound inner process taking place in people who arrive at a revolutionary front: they catch fire like a straw roof lit on all four sides, and then on cooling off become transformed into a fire-proof, perfectly clear and uniform piece of cast iron. Youngest of all was Mezhlauk. Valerian Ivanovich. He had a particularly hard time. His younger brother and wife had remained behind in Kazan and, according to rumor, had been shot. Later it turned out that his brother actually had died there, while his wife suffered indescribably. It was not customary to complain or talk about one’s misfortunes at Svyazhsk. And Mezhlauk kept an honest silence, did his work, and walked through the sticky autumn mud in his long cavalry coat, all of him concentrated on one burning point: Kazan. Meanwhile the Whites began to sense that with its strengthened resistance, Svyazhsk was growing into something great and dangerous. Intermittent skirmishes and attacks came to an end; a regular siege, with large organized forces on all sides was started. But they had already let slip the propitious moment. Old Slavin, Commander of the Fifth Army, not a very gifted colonel but one who knew his business exactly and thoroughly, fixed on a key point of defense, worked out a definitive plan and carried it through with truly Latvian stubborness. Svyazhsk stood firm, its feet planted in the ground like a bull, its broad forehead lowered toward Kazan, standing immovable on the spot and impatiently shaking its horns sharp as bayonets. One sunny autumn morning came narrow, agile and swift torpedo-boats from the Baltic fleet to Svyazhsk. Their appearance created a sensation. The Army now felt the river side protected. A series of artillery duels began on the Volga, occurring three or four times daily. Covered by the fire of our batteries concealed along the shore, our flotilla now ventured far forward. These forays were crowned by such extremely audacious ones as that undertaken on the morning of September 9 by Sailor Markin, one of the founders and outstanding heroes of the Red fleet. On an unwieldy, armor-plated tug boat he ventured far out to the very piers of Kazan, landed, drove off the crews of enemy batteries by machine gun fire and removed the locks from several guns. Another time, late at night on August 30, our ships came flush up to Kazan, shelled the city, set fire to several barges loaded with munitions and food supplies, and withdrew without losing a single ship. Among others Trotsky, together with the Commander, was aboard the torpedo-boat “Prochny” which had to fix its steering gear while drifting alongside an enemy barge and under the muzzles of the White Guard artillery. Vatzetis, commander-in-chief of the Eastern front, arrived at a moment when the offensive against Kazan was already in full swing. Most of us, myself among them, had little exact information concerning the outcome of the conference; only one thing quickly became a matter of general knowledge and was greeted with deep satisfaction on all sides: Our old man (that is what we called our commander among ourselves) declared himself opposed to Vatzetis’ views, who wanted to undertake an attack against Kazan from the left river bank, while our commander decided to storm Kazan on the right bank which dominates the city and not on the left bank which is flat and exposed. But precisely at a time when the entire Fifth Army was tensely poised for the attack, when its main forces at last began pushing forward under constant counter-attacks and many heavy day-long battles, three “luminaries” of White Guard Russia got together in order to put an end to the protracted epic of Svyazhsk. Savinkov, Kappel and Fortunatov at the head of a considerable force undertook a desperate raid against a railroad station adjoining Svyazhsk, in order in this way to capture Svyazhsk itself and the Volga bridge. The raid was brilliantly executed; after making a long detour, the Whites suddenly swooped down on the station Shikhrana, shot it to pieces, seized the station buildings, cut the connections with the rest of the railway line and burned a munition train stationed there. The small defending force at Shikhrana was slaughtered to the last man. Nor is this all; they literally hunted down and extirpated every living thing in this little station. I had the opportunity to see Shikhrana a few hours after the raid. It bore the stigma of the completely irrational pogrom violence that stamped all the victories of these gentlemen who never felt themselves the masters and future inhabitants of the soil accidentally and temporarily conquered. In a courtyard, a cow lay bestially murdered (I say murdered advisedly, not slaughtered); the chicken coop was filled senselessly with chickens riddled in all too human a fashion. The well, the little vegetable garden, the water tower and the houses were treated as if they had been captured human beings and, moreover, Bolsheviks and “sheenies” [a derogatory term for Jews]. The intestines had been ripped out of everything. Animals and inanimate objects sprawled everywhere, decimated, violated, ugly-dead. Alongside this horrible shambles of everything that once had been a human habitation, the indescribable, unutterable death of a few railway employees and Red Army men caught by surprise appeared quite in the nature of things. Only in Goya’s illustrations of the Spanish campaign and guerrilla war can a similar harmony be found of wind-swept trees bending low beneath the weight of hanged men, of dust on roadways, of blood and stones. In his absence “Free Russia” was shot to pieces and burned. Its black, burning hulk lay derailed for a long time beside the roadbed very close to Svyazhsk. After the destruction of the armored train the road to the Volga seemed completely open. The Whites stood directly beneath Svyazhsk, some 1-1/2 to 2 versts away from the Fifth Army’s headquarters. Panic ensued. Part of the Political Department, if not all of it, rushed to the piers and aboard the steam boats. The regiment, fighting virtually on Volga’s banks but higher upstream, wavered and then fled with its commanders and commissars. Toward morning, its maddened detachments were found aboard the staff ships of the Volga war fleet. In Svyazhsk only the Fifth Army staff with its officers and the train of Trotsky remained. Lev Davidovich [Trotsky] mobilized the entire personnel of the train, all the clerks, wireless operators, hospital workers, and the guard commanded by the Chief of Staff of the fleet, Comrade Lepetenko (by the way, one of the most courageous and self-sacrificing soldiers of the revolution whose biography could very well provide this book with its most brilliant chapter)—in a word, everyone able to bear a rifle. The staff offices stood deserted; there was no “rear” any longer. Everything was thrown against the Whites who had rolled almost flush to the station. From Shikhrana to the first houses of Svyazhsk the entire road was churned up by shells, covered with dead horses, abandoned weapons and empty cartridge shells. The closer to Svyazhsk, all the greater the havoc. The advance of the Whites was halted only after they had leaped over the gigantic charred skeleton of the armored train, still smoking and smelling of molten metal. The advance surges to the very threshold, then rolls back boiling like a receding wave only to fling itself once more against the hastily mobilized reserves of Svyazhsk. Here both sides stand facing each other for several hours, here are many dead. The Whites then decided that they had before them a fresh and well organized division of whose existence even their intelligence service had remained unaware. Exhausted from their 48-hour raid, the soldiers tended to overestimate the strength of the enemy and did not even suspect that opposing them was only a hastily thrown together handful of fighters with no one behind them except Trotsky and Slavin sitting beside a map in a smoke-filled sleepless room of the deserted headquarters in the center of depopulated Svyazhsk where bullets were whistling through the streets. Throughout this night, like all the previous ones, Lev Davidovich’s train remained standing there as always without its engine. Not a single section of the Fifth Army advancing on Kazan and about to storm it was bothered that night or diverted from the front to cover a virtually defenseless Svyazhsk. The army and the fleet learned about the night attack only after it was all over, after the Whites were already in retreat firmly convinced that almost a whole division was confronting them. The next day 27 deserters who had fled to the ships in the most critical moment were tried and shot. Among them were several communists. Much was later said about the shooting of these 27, especially in the hinterland, of course, where they did not know by how thin a thread hung the road to Moscow and our entire offensive against Kazan, undertaken with our last means and forces. To begin with, the whole army was agog with talk about communists having turned cowards; and that laws were not written for them; that they could desert with impunity, while an ordinary rank and filer was shot down like a dog. If not for the exceptional courage of Trotsky, the army commander and other members of the Revolutionary Military Council, the prestige of the communists working in the army would have been impaired and lost for a long time to come. It is said that among those shot were many good comrades, some even whose guilt was redeemed by their previous services, by years in prison and exile. Perfectly true. No one contends that they perished in order to prop up those precepts of the old military code of “setting an example” when amidst the beating of drums “an eye for an eye, a tooth for a tooth” were exacted. Of course, Svyazhsk is a tragedy. But everyone who has lived the life of the Red Army life, who was born and grew strong with it in the battles of Kazan, will testify that the iron spirit of this army would have never crystallized, that the fusion between the party and the soldier masses, between the rank and file and the summits of the commanding staff would have never been realized if, on the eve of storming Kazan where hundreds of soldiers were to lose their lives, the party had failed to show clearly before the eyes of the whole army that it was prepared to offer the Revolution this great and bloody sacrifice, that for the party, too, the severe laws of comradely discipline are binding; that the party, too, has the courage to apply ruthlessly the laws of the Soviet Republic to its own members as well. Twenty-seven were shot and this filled in the breach which the famous raiders had succeeded in making in the self-confidence and unity of the Fifth Army. This salvo which exacted punishment from communists as well as commanders and simple soldiers for cowardice and dishonor in battle forced the least class-conscious section of the soldier mass and the one most inclined toward desertion (and of course there was such a section, too) to pull themselves together, and to align themselves with those who went consciously and without any compulsion into battle. Precisely in these days was decided the fate of Kazan, and not that alone but the fate of the entire White intervention. The Red Army found its self-confidence and became regenerated and strong during the long weeks of defense and offense. In conditions of constant danger and with the greatest moral exertions it worked out its laws, its discipline, its new heroic statutes. For the first time, panic in the face of the enemy’s more modern technique became dissolved. Here one learned to make headway against any artillery; and involuntarily, from the elemental instinct of self-preservation, new methods of warfare were born, those specific battle methods which are already being studied in the highest military academies as the methods of the Civil War. Of extreme importance is the fact that in those days in Svyazhsk there was precisely such a man as Trotsky. No matter what his calling or his name, it is clear that the creator of the Red Army, the future Chairman of the Revolutionary Military Council of the Republic, would have had to be in Svyazhsk; had to live through the entire practical experience of these weeks of battle; had to call upon all the resources of his will and organizational genius for the defense of Svyazhsk, for the defense of the army organism smashed under the fire of the Whites. Moreover, in revolutionary war there is still another force, another factor without which victory cannot be gained, and that is: the mighty romanticism of the Revolution which enables people straight from the barricades to cast themselves immediately in the harsh forms of the military machine, without losing the quick, light step gained in political demonstrations or the independent spirit and flexibility gained perhaps in long years of party work under illegality. To have conquered in 1918 one had to take all the fire of the revolution, all of its incandescent heat, and harness them to the vulgar, repellent age-old pattern of the army. Up till now history has always solved this problem with imposing but moth-eaten theatrical tricks. She would summon to the stage some individual in a “three-cornered hat and a gray field uniform” and he or some other general on a white horse would cut the revolutionary blood and marrow into republics, banners, slogans. In military construction, as in so many other things, the Russian Revolution went its own way. Insurrection and war fused into one, the Army and the Party grew together, inseparably interwoven, and on the regimental banners were inscribed the unity of their mutual aims, all the sharpest formulas of the class struggle. In the days of Svyazhsk all this remained as yet unformed, only hanging in the air, seeking for expression. The Workers’ and Peasants’ Army had to find expression somehow; it had to take on its outward shape, produce its own formulas, but how? This no one clearly knew yet. At that time, of course, no precepts, no dogmatic program were available in accordance with which this titanic organism could grow and develop. In the party and in the masses there lived only a foreboding; a creative premonition of this military revolutionary organization which was never seen before and to which each day’s battle whispered some new real characteristic. Trotsky’s great merit lies in this, that he caught up in flight the least gesture of the masses which already bore upon it the stamp of this sought-for and unique organizational formula. He sifted out and then set going all the little practices whereby besieged Svyazhsk simplified, hastened or organized its work of battle. And this, not simply in the narrow technical sense. No. Every new successful combination of “specialist and commissar,” of him who commands and the one executing the command and bearing the responsibility for it—every successful combination, after it had met the test of experience and had been lucidly formulated, was immediately transformed into an order, a circular, a regulation. In this way the living revolutionary experience was not lost, nor forgotten, nor deformed. The norm obligatory for all was not mediocrity but on the contrary, the best, the things of genius conceived by the masses themselves in the most fiery, most creative moments of the struggle. In little things as well as big—whether in such complex matters as the division of labor among the members of the Revolutionary Military Council or the quick, snappy, friendly gesture exchanged in greeting between a Red Commander and a soldier each busy and hurrying somewhere—it all had to be drawn from life, assimilated and returned as a norm to the masses for universal use. And wherever things weren’t moving, or there was creaking, or bungling, one had to sense what was wrong, one had to help, one had to pull, as the midwife pulls out the newborn babe during a difficult birth. One can be the most adept at articulating, one can give to a new army a rationally impeccable plastic form, and nonetheless render its spirit frigid, permit it to evaporate and remain incapable of keeping this spirit alive within the chickenwire of juridical formulas. To prevent this, one must be a great revolutionist; one must possess the intuition of a creator and an internal radio transmitter of vast power without which there is no approaching the masses. In the last analysis it is precisely this revolutionary instinct which is the court of highest sanction; which exactly purges its new creative justice of all deeply hidden counter-revolutionary back-slidings. It places its hand of violence upon the deceitful formal justice in the name of the highest, proletarian justice which does not permit its elastic laws to ossify, to become divorced from life and burden the shoulders of Red Army soldiers with petty, aggravating, superfluous loads. Trotsky possessed this intuitive sense. In him the revolutionist was never elbowed aside by the soldier, the military leader, the commander. And when with his inhuman, terrible voice he confronted a deserter, we stood in fear of him as one of us, a great rebel who could crush and slay anyone for base cowardice, for treason not to the military but the world-proletarian revolutionary cause. It was impossible for Trotsky to have been a coward, for otherwise the contempt of this extraordinary army would have crushed him; and it could never have forgiven a weakling for the fraternal blood of the 27 which sprayed its first victory. A few days before the occupation of Kazan by our troops Lev Davidovich had to leave Svyazhsk; the news of the attempt on Lenin’s life called him to Moscow. But neither Savinkov’s raid on Svyazhsk, organized with great mastery by the Social Revolutionists, nor the attempt to assassinate Lenin, undertaken by the same party almost simultaneously with Savinkov’s raid, could now halt the Red Army. The final wave of the offensive engulfed Kazan. On September 9 late at night the troops were embarked on ships and by morning, around 5:30, the clumsy many-decked transports, convoyed by torpedo boats, moved toward the piers of Kazan. It was strange to sail in moonlit twilight past the half-demolished mill with a green roof, behind which a White battery had been located; past the half-burned “Delphin” gutted and beached on the deserted shore; past all the familiar river bends, tongues of land, sandbanks and inlets over which from dawn to evening death had walked for so many weeks, clouds of smoke had rolled, and golden sheaves of artillery fire had flared. We sailed with lights out in absolute silence over the black, cold, smoothly flowing Volga. Aft of the stern, light foam on the dull humming wake washed away by waves that remember nothing and flow unconcernedly to the Caspian Sea. And yet the place through which the giant ship was at this moment silently gliding had only yesterday been a maelstrom ripped and plowed by wildly exploding shells. And here, where a moment ago a nightbird tipped noiselessly with its wing the water from which a slight mist curled upward into the cold air, yesterday so many white spumy fountains were rising; yesterday, words of command were restlessly sounding and slim torpedo boats were threading their way through smoke and flames and a rain of steel splinters, their hulls trembling from the compressed impatience of engines and from the recoil of their two-gun batteries which fired once a minute with a sound resembling iron hiccups. People were firing, scattering away under the hail of downclattering shells, mopping up the blood on the decks.... And now everything is silent; the Volga flows as it has flowed a thousand years ago, as it will flow centuries from now. We reached the piers without firing a shot. The first flickers of dawn lit up the sky. In the greyish-pink twilight, humped, black, charred phantoms began to appear. Cranes, beams of burned buildings, shattered telegraph poles—all this seemed to have endured endless sorrow and seemed to have lost all capacity for feeling like a tree with twisted withered branches. Death’s kingdom washed by the icy roses of the northern dawn. And the deserted guns with their muzzles uplifted resemble in the twilight cast down figures, frozen in mute despair, with heads propped up by hands cold and wet with dew. Fog. People begin shivering from cold and nervous tension; the air is permeated with the odor of machine oil and tarred rope. The gunner’s blue collar turns with the movement of the body viewing in amazement the unpopulated, soundless shore reposing in dead silence.